Weather decisions are local...the soccer complex that hosts the games or practices have the responsibility for deciding if or when practices or games are to be postponed or canceled. The decision rests solely with the hosting complex or club, not the visiting team or their home club (see what to expect below). 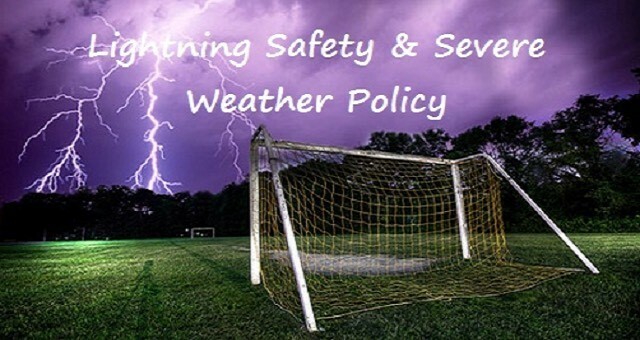 Player safety and injury prevention drive all weather-related decisions...Lightning is the #1 weather-related danger when storms are near, but poor field conditions from rain can also create an unsafe playing surface depending on the amount of accumulated rainfall over a period of hours or days. See Lightning Safety Outdoors. Again, these decisions must be made at the local level by the host club. Lightning...If lightning strikes within 6-10 miles of the complex, a lighting delay will be initiated. Play or practices will be postponed until no strike has occurred within a 6-10 mile radius for the preceding 20-minutes minimum. A distance "range" is used because the severity of the storm and the speed and direction it is traveling are taken into consideration, but safety is ALWAYS the PRIORITY. After the first or second lightning delay, the complex/officials may or may not make the decision to cancel or reschedule a game or practice. See Lightning Safety Outdoors. Rainfall...soccer is an all-weather sport. Unless there is a safety concern such as lighting or unsafe field conditions, games will likely be played. During the season, hundreds of games are scheduled each weekend and rescheduling a full-days slate of games is difficult. Games will not be canceled for light showers or uncomfortable temperatures (hot or cold). Field conditions...if there has been enough accumulated rainfall a game or practice may be canceled or postponed to avoid injury or excessive wear and tear on the fields. When the severe weather horn is sounded or a referee stops play for weather, you must get off the field and seek shelter as quickly as possible. A dangerous storm could be coming in quickly! DO NOT group together in the open or stand under trees or canopies to talk. THIS IS DANGEROUS AND COULD BE FATAL! DO move to a secure, grounded building or to your vehicle (preferred) for safety. DO NOT LEAVE THE COMPLEX...stay in communication with your coach or team manager for updates. You can also monitor the host club's social media channels, Rainout or REMIND text message app to stay informed of when games will resume or be canceled. WAIT FOR THE ALL CLEAR BEFORE RETURNING TO THE FIELD. Typical lightning delays may run from 15-30 minutes (maybe longer) depending on the severity of the situation. If a cancelation is required, it could be for just the current time slot of games or for the remainder of the day. Be prepared and stay patient. Know that every complex, club, and referee strive to provide a safe and secure facility for the participants and spectators. Likewise, postponing or rescheduling games is a major decision that potentially affects 1000's of people. Club officials use a combination of weather forecasts, lightning detection technology and the visual observations of referees and club officials on site to make the final decision. If it is deemed safe to play, games will resume. If not, expect a delay or cancellation. You can do your part by understanding this policy, remaining calm and patient and helping us keep players safe. Please trust and respect the decisions of the complex officials.